I started doing mission trips with my youth group in 1997 when my daughter was 12. We really enjoyed the work and the friendships of those week trips each summer. In 2006, a fellow adult trip leader asked if I’d like to join her on a mission trip to Armenia where her son was a Peace Corps Volunteer. This was the next logical step in my love affair with service, so of course I was in! Though luggage arrived 4 days later than we did, and my arms were aching after the first full day of sanding/plastering, I was thoroughly enamored of Armenia. We stayed in a wonderful B&B in Yeghegnadzor where breakfasts were amazing and the atmosphere was soothing and homey. The rugged beauty of the countryside was always in my camara lens. I absorbed more history though discussion and sightseeing than I thought possible for a country the size of Maryland. My heart grew to contain Armenia within it. We worked alongside the homeowner’s family, relatives and friends each day. We ate with them, played with them, laughed with them, and sometimes are able to celebrate the House Blessing with them, which is both an honor and a blessing. Each year the time spent working with families has been precious. 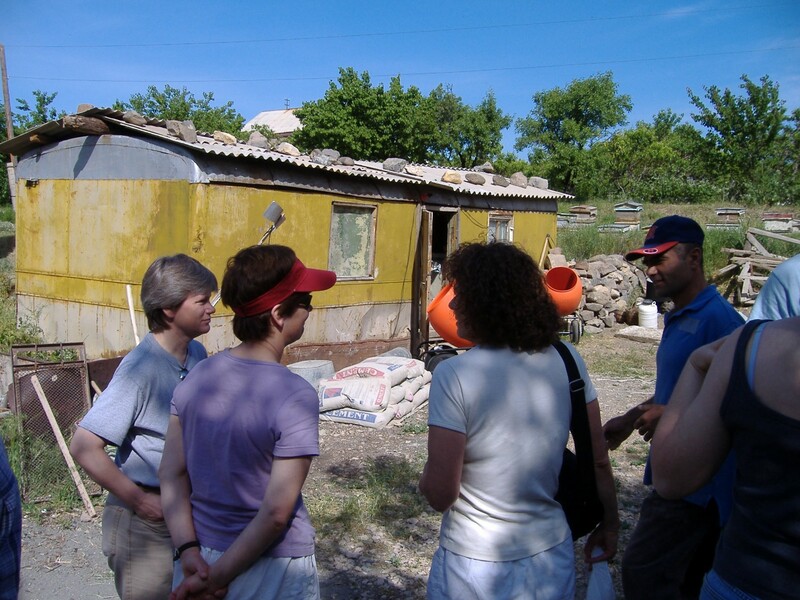 In 2006, We worked in Areni and completed the home. I have since returned to see them prospering. In 2007, 08, 09 we worked in Shatin Village marking improvements each year beyond our aid. We were even honored by the mayor for our continued work in their village. In 2010, 11 we worked in Dasht Village and were able to see the prosperity of our first family during the second year. Hearing how that family has had a wedding and is expecting a birth brings home the truth that with a safe, warm home families lives can move forward in joy! Seeing them again was like seeing 10 years of worry melted off their features! The changes in my world view are the greatest gift I have recieved from giving to others. I recognize the abundance I have, but were it not for family and obligation I would give it up to spend a lifetime helping others. As it is, each year I plan another return trip and hope to share this purposeful experience with as many others as are willing to step up and say, "I will go!" I am already in the planning stages to return to Armenia next summer, probably late July, 2012. Though the dates are not set yet I will be looking to build a team of 10-14 people from all walks of life willing to GO, do, see, learn and experience a vacation with a purpose! Look for me on the website soon and join up now!